It’s funny, in a way, to name a car after a number. There are definitely other manufacturers who have done it, and many manufacturers have numerical model designations that follow a definite logic, but but if you think of a certain Audi coupe with all-wheel-drive and a turbocharged five-cylinder, would you call it the “Audi 4”? Following this admittedly thin premise, let’s take a look at the 4’s cheaper sibling, the “2”, or in Auditalian, the “Due”. 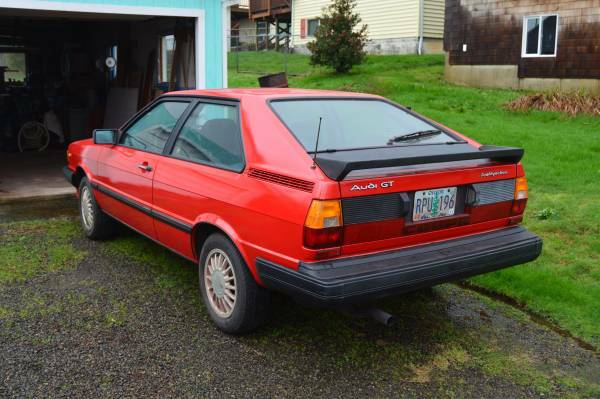 Check out this 1984 Audi GT Coupe for sale for $2800 somewhere west of Portland, OR. Still a handsome car, though the absence of box flares means it probably didn’t feature heavily on bedroom walls. The current owner has had it since 1994, putting about 160K on the clock. Everything is said to work aside from the side mirror adjusters, and the seller’s disarming tone in the listing gives confidence that this actually is a faithful friend that will still give more miles of service. Most GTs of this age have been subjected to being poorly Quattro-ized, are beaten-up, or have simply disappeared. No maintenance history is mentioned, but the car has likely been repainted at least once in its life. Close-up pictures of the interior show a cracking dash, which is not surprising for any 1980s VW/Audi product. Unfortunately, there is no picture of the engine, but US models all received the 100hp 2.1-liter five featured in Audi’s sedans – they have a nice exhaust note, so it could be fun to install a more open exhaust. 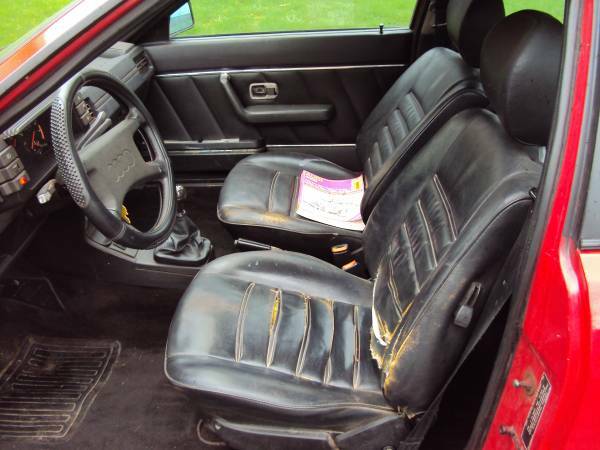 Though it certainly shows its age, the interior does not look hacked up – if you wanted to be fairly cheap about it, a dash mat and seat covers (along with getting rid of that ugly steering wheel cover – why do people buy these?) would spiff things up sufficiently. Go fancy and you could install some kind of aftermarket or sportier factory steering wheel, reupholster the seats in the original pattern, and send the dash off to Just Dashes. The period 1980s radio is also a nice feature. 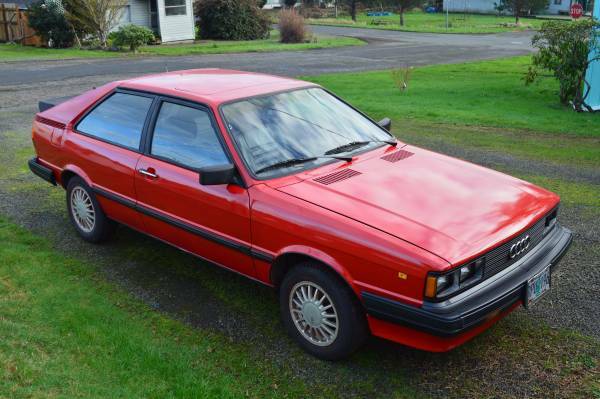 What would you do with this car – if a Quattro’s moved out of your price range, and E30s are just too common, maybe this is a good alternative! This entry was posted on April 16, 2015 at 12:26 pm and is filed under Feature. You can follow any responses to this entry through the RSS 2.0 feed. You can leave a response, or trackback from your own site.